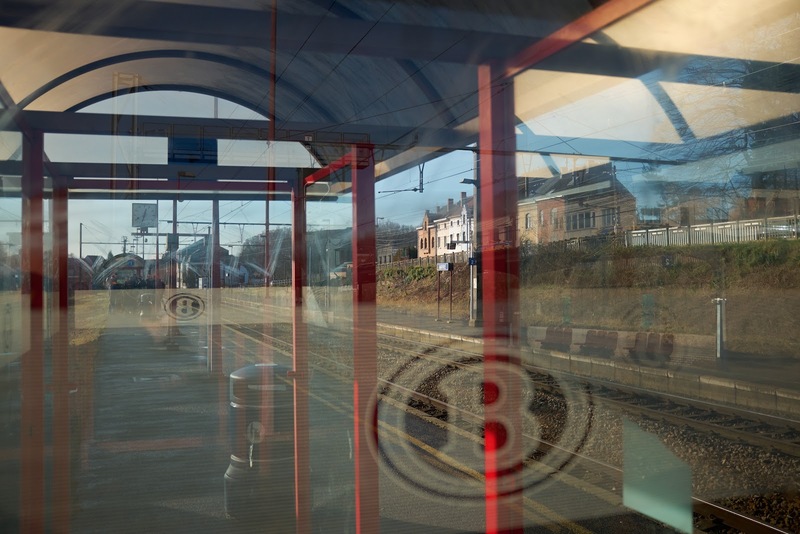 I am doing a series on the surroundings of the train station in Wavre. That means walking around, wandering the streets, looking, observing, taking a picture from time to time. I usually carry two camera's on these occasions, the X100s and the X-Pro 1with a fixed prime (I don't use zoom lenses, I don't even own any) and I change lenses when needed. With fixed primes you get to know what a lens will do, what angle of view to expect, how it will render a scene. That is really important for me. I usually see a photo coming before it's there, and I find that very difficult using a zoom. With a zoom, I react, but with a fixed prime, I can anticipate, huge difference. I find myself using the EV on both camera's most of the time, but I would not like to be without the OV (these are the two finder types you can select on these camera's as part of the hybrid viewfinder). The EV makes your exposure setting very easy, the image you see in the viewfinder gives a very reliable indiction on what the exposed image will look like, especial when you get to understand what you see, like realizing that the picture will have more detail in both the shadows and the highlight then shown in the viewfinder. All exposures and focusing by hand.